Sandwiches are served by themselves. All sides are served a la carte. ** Sandwiches marked with an asterisk are NOT available AFTER 3pm. Thin-sliced ham piled high with cheddar cheese on a fresh French loaf & dressed to order. Delicious golden brown catfish fillets placed between fresh French loaves & dressed to order. Italian & Nawlin’s cuisine collide in this delectable sandwich. Golden fried chicken breast topped with melted Mozzarella and zesty marinara sauce. Dressed to order. Steaming hot sliced roast beef piled high on a French loaf topped with beef gravy and dressed to order. It’s messy, but oh so good. Our meaty grilled hamburger patties on a fresh French loaf & dressed to order. Add cheese for a little extra. Crisp and golden fries piled high on a fresh French loaf, drenched with our hot roast beef gravy & dressed to order. Our #1 favorite poboy. 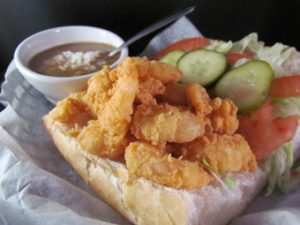 Golden-fried Gulf shrimp piled on a fresh French loaf & dressed to order. Goes great with a tall cold draft beer! Gulf oysters, breaded and fried ’til golden brown, served on a fresh French loaf & dressed to order. Most people like to add a little cocktail or hot sauce to kick it up a notch! Spicy sausage patties, grilled and stacked on a fresh French loaf, then dressed to order. This one really hits the spot. Triple-decker sandwich featuring sliced ham, turkey, bacon, lettuce. tomato, sliced American and Swiss cheese, and mayo. Best bring your appetite for this one! Invented in New Orleans, this is the classic Italian sandwich featuring Genoa Salami, Ham, Monterrey Jack cheese, and fresh olive salad, served on a large, round Italian loaf. Most people can’t eat a whole, so we recommend a half or quarter per person. Whole softshell crab, battered and golden fried, placed on a fresh French loaf and dressed to order. Succulent Louisiana redfish fillets, battered, fried, placed on a fresh French bun and dressed to order.